ANN ARBOR, Mich. - For the third season in a row, Michigan basketball is among the final 16 teams left in the NCAA Tournament. The Wolverines punched their Sweet 16 ticket with wins over Montana and Florida in the first two rounds, but the road to the Final Four in Minneapolis is about to get much tougher. Last season, Michigan basketball caught a few breaks en route to the national championship games. Houston, a No. 6 seed and the No. 18 team in Kenpom, was the highest-ranked team Michigan played before running into Villanova. Michigan played Texas A&M, Florida State and Loyola Chicago in its final three wins, and all three ranked outside the top 25 in Kenpom. This year, with most of the top seeds winning the opening weekend, Michigan will have to take a more traditional route. First, the Wolverines will match up with No. 3 seed Texas Tech, the top defensive team in the country and the No. 7 overall team in Kenpom. The Red Raiders won the regular-season Big 12 title and likely would have been a No. 2 seed if not for an early exit in the conference tournament. Texas Tech is the top-ranked No. 3 seed in the tournament and even ranks ahead of No. 2 seeds Kentucky and Tennessee in Kenpom. With the top two defenses in the country clashing, points will likely be at a premium in this Sweet 16 matchup, unlike when Michigan blitzed Texas A&M with 99 points last season. Michigan's defense will also have to deal with future NBA lottery pick Jarrett Culver, who averaged 18.8 points, 3.8 assists and 6.5 rebounds this season. Culver scored 45 points against Northern Kentucky and Buffalo last weekend. If Michigan survives the Red Raiders, it will either play top-seeded Gonzaga or earn an Elite Eight rematch with Florida State. Michigan survived a 58-54 scare from Florida State last season, but this year's Seminoles squad is much improved. As a No. 4 seed this season, FSU is led in scoring by Mfiondu Kabengele and also has an elite guard duo in Terance Mann and Trent Forrest. Florida State is currently the No. 14 team in Kenpom. Gonzaga, on the other hand, is a daunting potential matchup. The Bulldogs were No. 1 in the first year of the NET rankings and No. 2 behind Virginia in Kenpom. The No. 1 offense in the country is led by Rui Hachimura, Brandon Clarke and Zach Norvell, all of whom average between 15 and 20 points per game. Michigan might be even better this season than last, but the absence of go-to players on offense makes it more difficult to trust in this win-or-go-home format. During all three losses to Michigan State this season, the Wolverines held second-half leads before long cold stretches ultimately doomed them. There was evidence of those offensive lulls against Montana and Florida, and that could be a red flag as the competition gets even tougher. The Texas Tech-Michigan matchup pits two elite defensive teams against each other, and the Wolverines struggled against the other elite defenses they saw this season: Michigan State and Wisconsin. If Michigan survives, it could see its defense tested by the runaway best offense in the country in Gonzaga. Florida State would be another top-10 defensive battle. 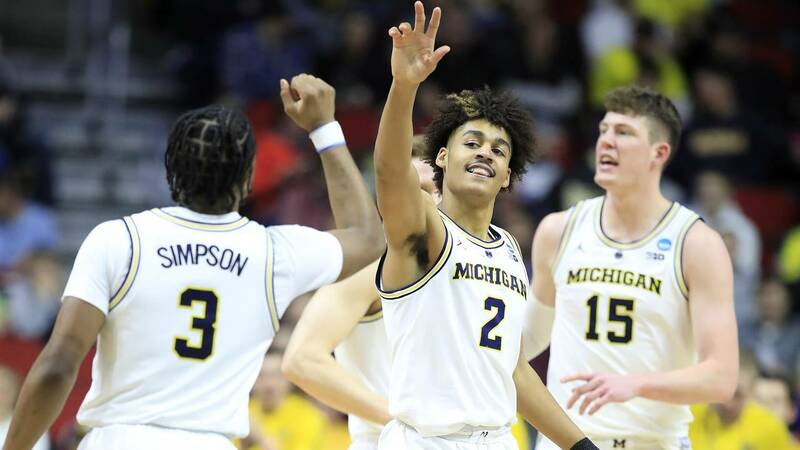 Unlike last season, when upsets helped pave the way for Michigan in the NCAA Tournament, this year's team will have to survive the best of the best to get to Minneapolis.